The browser version you are using is not supported by Kiva. Please use the most recent version of these supported browsers for Kiva to function properly. Fund a loan, get repaid, fund another. Browse categories of borrowers— people looking to grow businesses, go to school, switch to clean energy and more. Use the repayment to support another borrower, or withdraw your money. Select a borrower who you connect with and help fund a loan with as little as $25. Receive updates on your loans and see the dollars return to your Kiva account. Browse categories of borrowers— people looking to grow businesses, go to school, switch to clean energy, and more. A loan of $1,375 helped a member to pay for additional clothes. Marie is a fifty years old business woman. She is the leader of Maxam solidarity group. Maxam solidarity group has four members who are all women. Marie is standing at the front left of the picture. Marie sells clothes . Marie has been in this business for the past fifteen years. Marie established her business to provides for her children welfare. She buys learning material and provides food from the profit she gets from her business. 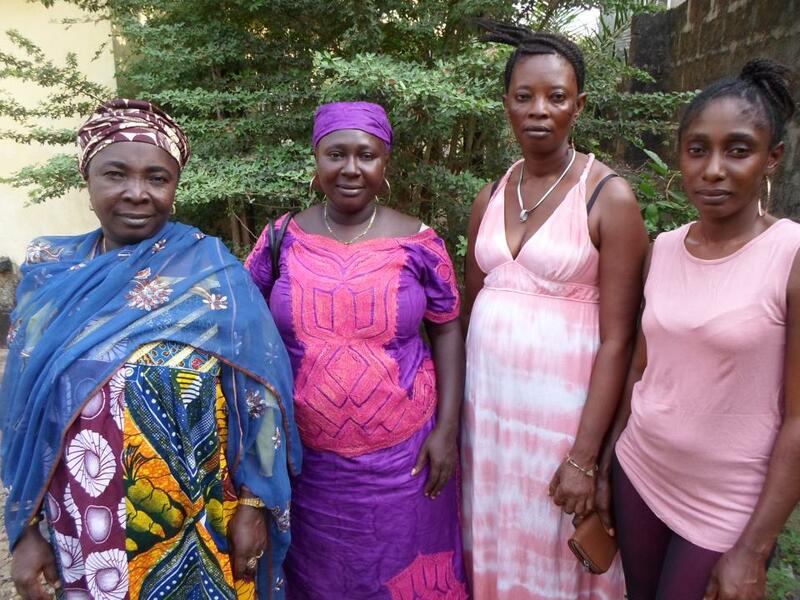 Marie and her group member’s needs a loan totaling 5,500,000 SLL of which Marie is entitled to 1,500,000 SLL which she will use to buy additional clothing materials. She hopes that this loan will help her generate more profit to support her family. Marie is a widowed with seven children age thirty-five, thirty, twenty-eight, twenty-five, twenty-three, twenty and sixteen. In the feature, Marie plan to save more money to provide for her younger children’s university education. Marie and the rest of the group members thank you for your support. It helps a borrower in Sierra Leone where Ebola has affected the economy. The Association for Rural Development (ARD) is one of the leading microfinance institutions in Sierra Leone. Established in 1989, ARD has offered individual and group loans to support small-scale businesses across the country for two decades. You can learn more about ARD on its partner profile page, support the organization and its staff by joining the ARD lending team, or lend to another one of its borrowers currently raising funds on Kiva. The loan length or repayment term is the number of months it takes from the point that the loan is disbursed to the borrower to the point when the last repayment is due to be paid to Kiva lenders. To see a detailed repayment schedule for a specific loan, click the "Repayment schedule" link on the loan profile under "Loan details." What is the disbursed date? The disbursed date indicates the date that the borrower receives their loan funds. Loan disbursal for loans on Kiva can happen anywhere from 30 days before to 90 days after the loan is posted on the Kiva website. Direct loans are always post-disbursed, and will be done only after the loan has fully fundraised on Kiva. In the case of partner loans, many of Kiva's Field Partners choose to disburse loan funds before the loan request is posted on Kiva. We allow pre-disbursal because it ensures that the funds reach the borrower as soon as they are needed. Loan funds from Kiva lenders then go to backfill that amount and as a lender you assume the risk of the loan. By doing this, our Field Partners assume the risk that, if the loan isn't funded by Kiva lenders, the Field Partner has to fund the loan without any funds from Kiva lenders. If a partner loan is not pre-disbursed, it will be listed on Kiva with an expected "post-disbursed" date. If a post-disbursed loan is not funded on Kiva, there is a chance that the borrower may not receive their loan. Some Field Partners choose to disburse loans with other sources of funding, while other partners don't have the resources available to fund loans without Kiva lenders' support. No direct loans will be disbursed unless they fully fundraise on Kiva. What is currency exchange loss and how could it affect my Kiva loans? When lending internationally, the local currency in a borrower's country may lose some of its value compared to the US dollar -- requiring the partner to use more of its local currency to reimburse Kiva in USD. We offer Field Partners the option to protect themselves against severe currency fluctuations (a USD appreciation of over 10% relative to their local currency) by sharing any losses greater than 10% with Kiva lenders. By bearing these losses, lenders protect the partner and its borrowers from catastrophic currency devaluations. "Covered" means the Field Partner has opted to cover any currency loss. Lenders will not bear losses due to currency fluctuation. "Possible" means the Field Partner has opted not to cover these losses, and lenders face additional risk because they will bear losses greater than 10%. "N/A" means the Field Partner disburses loans to borrowers in USD so their loans are not subject to any currency fluctuation. Do Kiva borrowers pay any interest on their loans? Yes, most Kiva borrowers do pay interest to our Field Partners in some form. Kiva and Kiva lenders themselves do not receive interest on these loans. Our partners collect interest from borrowers because there are many operational expenses associated with microfinance in developing markets, especially in rural areas. Many of Kiva's Field Partners also provide additional services alongside their loan products such as business training, financial literacy lessons, or health services. Kiva will not partner with an organization that charges unreasonable interest rates, and we require Field Partners to fully disclose their rates. In addition, we only partner with microfinance institutions and organizations that have a social mission to serve the poor, unbanked, and underserved. There are some 0% interest loans on Kiva, including all direct loans in the United States. To learn more about the interest rates Kiva borrowers pay, you can review the "Average cost to borrower" field on a loan profile. What is a risk rating? The Field Partner risk rating reflects the risk of institutional default associated with each of Kiva’s Field Partners. A 0.5-star rating means the organization has a relatively higher risk of institutional default, while a 5-star rating indicates the organization is at a relatively lower risk of default, based on Kiva's analysis and the available information displayed in the Field Partner section of every loan. Field Partners with the lowest credit tier undergo a lighter level of due diligence and do not receive a risk rating; instead, in places where a risk rating would normally appear, these partners are labeled as “Experimental.” For more information, see "What is an Experimental Field Partner?" Direct loans also do not receive a formal risk rating. Instead, these loans are approved through “social underwriting”, where trustworthiness is determined by friends & family lending a portion of the loan request, or by a Kiva approved Trustee vouching for the borrower. Direct loans will appear as "Unrated" and lenders should always assume these loans represent the highest level of repayment risk on Kiva. Kiva loans are facilitated through 2 models, partner and direct, that enable us to reach the greatest number of people around the world. For partner loans, borrowers apply to a local Field Partner, which manages the loan on the ground. Field Partners are responsible for screening borrowers, disbursing loans, posting borrowers to the Kiva website for funding, collecting repayments and otherwise administering Kiva loans on the ground to borrowers. For direct loans, borrowers apply through the Kiva website and may or may not be endorsed by a Trustee. Unlike Field Partners, Trustees don't handle any financial transactions or have any duty to repay loans on behalf of their borrowers. Instead, Trustees take the role of providing support and business advice to their borrowers throughout the term of the loan. Field Partners often work with borrowers over time to help them build credit and expand their businesses. In order to make it easier for partners to post loans for borrowers who have been listed on Kiva before, we allow some partners the ability to relist a loan without having to re-enter all of the borrower's information. When this occurs, you'll see an updated loan description, as well as excerpts of the original descriptions from an earlier loan. Most borrowers take out loans consecutively, meaning that they receive a second loan after having repaid the first. However, sometimes our Field Partners give out concurrent loans, allowing borrowers to take out one primary loan and a secondary "add-on" loan along with it. These additional loans are typically smaller than the borrower's primary loan and serve a different purpose. We trust our partners to determine whether a borrower has the means to be able to repay a successive or concurrent loan. Like Kiva, ARD is committed to providing sustainable, efficient and cost effective financial services to populations that have limited access to finance. This partnership is part of a broader expansion effort focused on identifying strong and emerging microfinance institutions in post-conflict countries like Sierra Leone, where there are large unbanked populations. Kiva lenders’ funds support ARD to expand its services to more underbanked people to help them build businesses and gain financial independence. Time on Kiva shows the number of months a Field Partner has been posting loans to Kiva for funding. This figure represents the total number of borrowers posted by this Field Partner that have raised loans on Kiva. This number includes individual borrowers within any of this Field Partner's group loans. Total loans indicates the total amount of loans this Field Partner has raised through the Kiva website. This excludes refunded loans. Although Kiva and its lenders don't charge interest or fees to borrowers, many of Kiva's Field Partners do charge borrowers in some form in order to make possible the long-term sustainability of their operations, reach and impact. For this specific Field Partner, Kiva displays portfolio yield (PY), which is equal to a Field Partner's financial earnings divided by its average loan portfolio outstanding during a given year. Currently, Kiva displays portfolio yield for most of its Field Partners that are microfinance institutions (MFIs). Portfolio yield applies to the institution as a whole, and thus is a proxy for cost to borrowers rather than a direct measurement. Kiva calculates portfolio yield directly from the most recently available financial statements of a Field Partner and compares this result with other publicly available sources of pricing information such as mixmarket.org and mftransparency.org. For more information, please visit: What do “Average cost to borrower” and “PY” mean? What does "Profitability (Return on Assets)" mean? "Return on Assets" is an indication of a Field Partner's profitability. It can also be an indicator of the long-term sustainability of an organization, as organizations consistently operating at a loss (those that have a negative return on assets) may not be able to sustain their operations over time. A Field Partner's average loan size is expressed as a percentage of the country's gross national annual income per capita. Loans that are smaller (that is, as a lower percentage of gross national income per capita) are generally made to more economically disadvantaged populations. However, these same loans are generally more costly for the Field Partner to originate, disburse and collect. Kiva defines a partner's delinquency (arrears) rate as the amount of late payments divided by the total outstanding principal balance Kiva has with the Field Partner. Arrears can result from late repayments from Kiva borrowers as well as delayed payments from the Field Partner. The loans at risk rate refers to the percentage of Kiva loans being paid back by this Field Partner that are past due in repayment by at least 1 day (also known as arrears). This delinquency can be due to either non-payment by Kiva borrowers or non-payment by the Field Partner itself. Example: A partner has fives loans that are in “paying back” status and the loan amount for each is $100. All of the loans have first installments of $10. One borrower repays only $9 and hence, his loan is in arrears. The other four borrowers repay $10. The loans at risk rate is 91 / 451 = 20.18%. The loans at risk rate is an aggregate that does not distinguish between borrower delinquency and partner delinquency. So in the example above, the loans at risk rate will be 20.18% regardless of whether it is the borrower or partner that is behind in repayments. The default rate is the percentage of ended loans (no longer paying back) which have failed to repay (measured in dollar volume, not units). - Many Field Partners do not yet have many ended loans due to their short history on Kiva (see "Time on Kiva"). If this is the case, a more meaningful indicator of principal risk is "delinquency rate." - At Kiva, we define default (non-repayment) as: the time when Kiva determines that collection of funds from a borrower or partner is doubtful, or the cumulative amount repaid as of a quarterly reconciliation is less than the amount expected as of 180 days prior and there have been no repayments reported to Kiva during this time. . Kiva typically processes defaults on a quarterly basis, and case by case exceptions may be made if the partner or Kiva anticipates future repayments to be made on the loan. Field Partners also have the option to default loans at any time, should they determine that further collection of loan repayments from the borrower is unlikely. Kiva calculates the Currency Exchange Loss Rate for its Field Partners as: Amount of Currency Exchange Loss / Total Loans. Kiva is able to reach more borrowers in some of the most remote places around the world through our global network of Field Partners. These partners are local organizations working in communities to vet borrowers, disburse loans, collect repayments, provide services and administer loans on the ground in general. Kiva's Field Partners are nonprofit organizations, microfinance institutions, schools, social enterprises and more. Many provide services alongside their loans, such as entrepreneurial training or finanical literacy development. What is a Field Partner? Loan tags help lenders find loans that match certain areas of interest. Photos with beautiful fabrics, or loans for fabrics, sewing, weaving, embroidery, etc. You are opting out of using Free Trial. You have selected to not use your Free Trial and will be prompted to pay for this loan using your own money. Shoot! This loan is ineligible. Your free credit can't be applied to this loan. If you would like to make a loan to this borrower anyway, you will have to use your own money. You cannot use your Free Trial to support this loan. Free Trials cannot be used to make loans during their private fundraising period on Kiva. If you would like to lend to this borrower anyway, you will have to use your own money.